With a Shutter Precision Dynamo hub built into your Velocity wheel, you’ll never have to worry about batteries or charging electronics ever again! The SP Dynamo system was innovatively designed to offer a low weight with a sturdy construction, able to withstand stresses to the wheel while preserving a stylishly simple appearance. SP takes great effort to produce reliable hubs at a fair price to give their customers the best value when choosing a dynamo hub. We feel their values mirror a lot of our own, and we’re thrilled to offer a Velocity USA wheel build with SP Dynamo hubs. Whether you’re a Gear-Head, a commuter, randonneuring, or doing the Tour Divide, we can help point you in the right direction. We can build any rim up with a Dynamo hub. 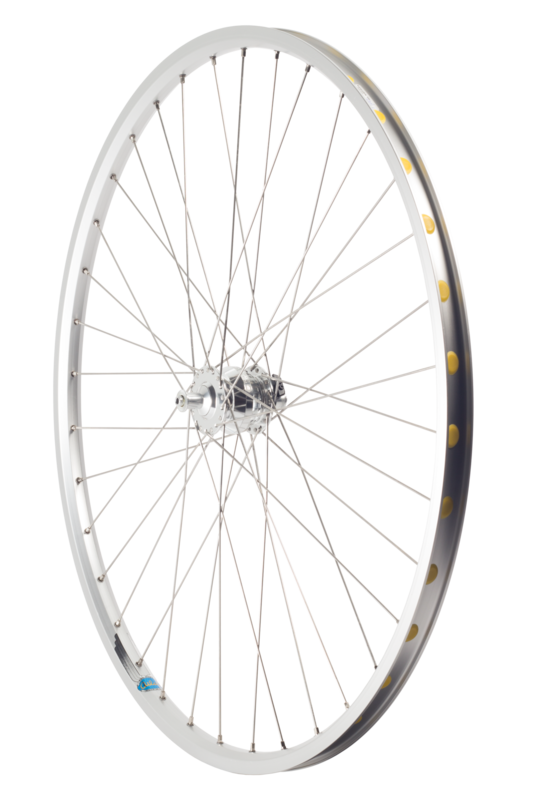 Adds $100 to the retail price for a QR hub or $150 to the retail price for a 15x100 thur-axle. *Other options available as a special order. Ask us about price and wait time.